Strengthen your brand identity and promote your products with business labels. Stick them on your bottled and canned products or use them on paper bags for packaging. Whatever you choose, you can make your business labels custom to your product. Create a unique design which will remind people about your brand by including your logo and adding some quotes or short text for extra character. Inform people what they will get from your products by including product details like ingredients, health benefits, or the materials used. UPrinting offers cut-to-size and roll business labels. Both are available in standard and custom sizes. UPrinting offers cut-to-size and roll business labels. Both are available in standard and custom sizes. Cut-to-size labels are individually cut and come in square or rectangle shapes. We have them available in matte or gloss finish. White vinyl high gloss material is the perfect choice for outdoor applications. It is waterproof and can endure harsh environmental situations. We cater to both small and large orders. 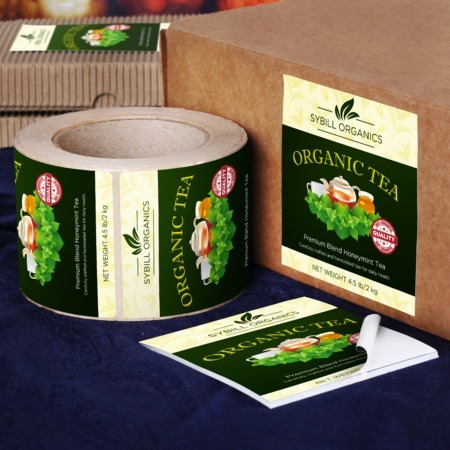 Roll labels come in rectangle, square, round or oval shape. Use them for your promotions, company events, trade shows, or branding. You can also use them to create adhesive business cards. Order from 25 to 100,000 pieces in one job order. Have them shipped as fast as 1 business day for cut-to-size and 2 business days for roll labels.